Cyfrowy Polsat Group ended 2018 with very good financial and operating results. The Group accomplished its assumed goals and strengthened its position on the pay TV, telecommunications as well as TV broadcasting and production markets. It currently provides nearly 14.3 million services and thanks to the consistent implementation of the multiplay strategy it has seen further reduction of the already record-low churn level. Its current operations have been effectively supported by strategic acquisitions and multi-faceted distribution of broadcasting rights to UEFA Champions League matches. The revenue grew by more than 10%, reaching PLN 10.7 bn while EBITDA increased by 7%, to PLN 3.7 bn. - Stable growth of the number of customers using multiplay services – up by 285 thousand (19%) YoY, to 1.8 million, which is equal to 31.5% of contract customer base. - The number of services used by this group increased to 5.38 million. - These developments led to further reduction of churn ratio, to a record-low level of 7.6% annually. - Another period of growth of the number of mobile services – up by 413 thousand YoY to 7.3 million as a result of favorable influence of the multiplay strategy, customers’ sustained interest in Plus’s simple tariffs which were launched last February, and high sales in the B2B segment (m2m solutions). - Thanks to good sales of basic packages as well as of value-added services (Multiroom HD and paid OTT services), the total number of contract pay TV services increased by 156 thousand YoY and exceeded 5 million. - Stable base of Internet access services, of 1.8 million. In 2018 Cyfrowy Polsat’s and Plus’s residential customers generated ca. 965 PB of data transfer. The coverage of the Group’s LTE services extends over a territory inhabited by nearly 100% of Poland’s population, with LTE Advanced being available to 73% of Poles. - Growth of the number of services per customer – up by 5.5% YoY with each customer using, on the average, 2.5 services from the Group’s portfolio. 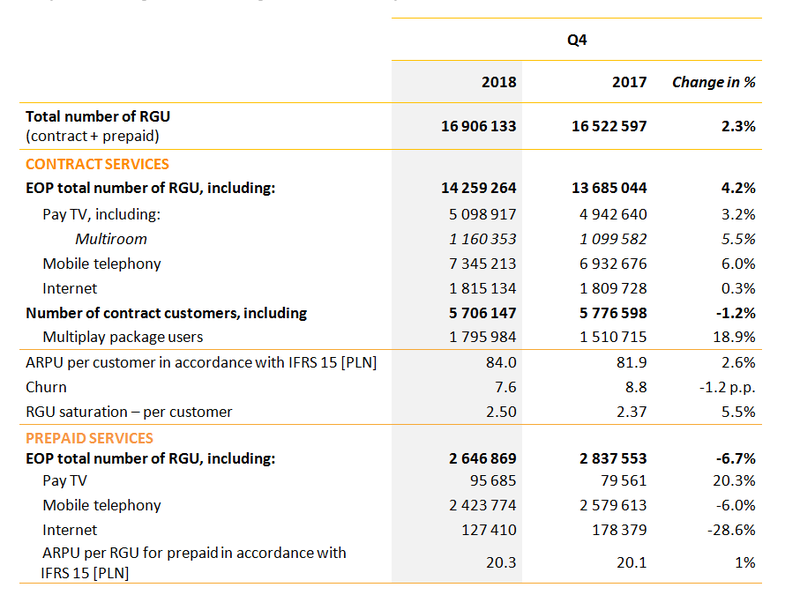 - The average revenue per contract customer (ARPU), calculated in accordance with the currently valid IFRS 15 reporting standard, increased by 2.6% YoY, to PLN 84 in Q4 2018. - Prepaid ARPU remained at a high, stable level of PLN 20.3 in Q4. 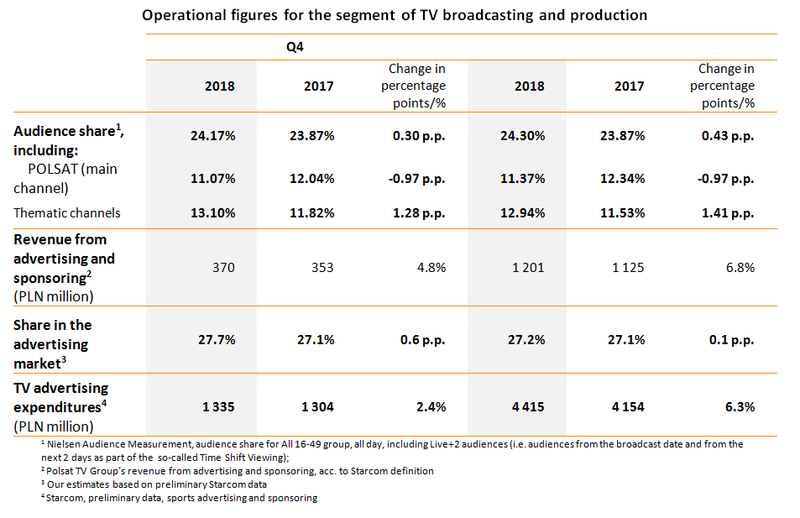 In accordance with the long-term strategy, Polsat TV channels remained among market leaders in terms of audience share, both in Q4 as well as throughout 2018, reaching the level of 24.2% in Q4 (respectively 11.1% for the main channel and 13.1% for the theme channels) and 24.3% during the entire year (11.4% for Polsat’s main channel and 12.9% for the theme channels). The revenue of Polsat TV Group from TV commercials and sponsoring increased in Q4 by 4.8% YoY and reached PLN 370 million, which resulted in the Group’s share in TV advertising market reaching 27.7%, while for the whole of 2018 Polsat TV Group recorded growth by 6.8%, to PLN 1.201 billion, which gave it market share of around 27.2%. “In 2018 we are able to implement all our plans and assumptions while strengthening our position on pay TV, telecommunications as well as TV broadcasting and production markets. We continued growth in the segment of multiplay services while offering a wide range of services and attractive bundles to our customers. Our success is best demonstrated by the figures – we have nearly 1.8 million multiplay customers who have bundled together nearly 5.4 million pay TV, mobile telephony and Internet access services. Plus was the leader in the MNP area, and it was the only infrastructural operator to have recorded positive MNP balance last year. For the first time in history we were providing in excess of 14 million contract services while the churn level continued to decrease and reached a record-low level of 7.6%, which is indicative of high satisfaction of our customers with the services we provide to them. We can confidently say that we have the most loyal customers. And we would like to thank them very much for their trust”, says Tobias Solorz, the CEO of Cyfrowy Polsat S.A. and Polkomtel Sp. z o.o. “In 2018 our operations were effectively supported by our strategic acquisitions. Adding Netia to Cyfrowy Polsat Group enabled our companies to embark on operational cooperation in key areas. Fiber-optic Internet access, offering transfer rates of up to 900 Mbps, has been added to our smartDOM loyalty program, while Netia’s TV offer has been extended to include new TV stations from Polsat TV’s rich portfolio of channels and the package including the UEFA Champions League and the UEFA Europa League matches. Acquisition of shares in Eleven Sports Network’s Polish operations resulted in strengthening of our premium sports offer”, adds Mr. Solorz. “During Q4 as well as during the whole of 2018 our channels occupied leading spots in terms of audience in the commercial group. This concerned both, our main channel and the thematic channels while Polsat Group’s viewership results are in line with our long-term strategy. In turn, our revenues from TV advertising and sponsoring grew slightly faster than the market last year, in spite of the impact of such events as e.g. the FIFA World Cup Russia 2018 which was being broadcasted by the public broadcaster”, says Maciej Stec, a Management Board of Cyfrowy Polsat S.A. and Telewizja Polsat Sp. z o.o. “We have substantially strengthened the sports segment of our TV operations. Four Eleven Sports premium TV channels, which are growing very fast on Polish market, have been added to our portfolio. The Eleven Sports channels own attractive broadcasting rights to, among others, the matches of European football leagues and Formula 1 races. We quickly started multi-layer distribution of broadcasting rights to the UEFA Champions League matches. We have launched new Polsat Sport Premium channels and services featuring coverage of the matches thanks to which, for the first time in Poland, all Champions League matches can be watched live in TV, without any commercials and in HD quality, together with match commentary and analyses provided from the most advanced sports TV studio in Poland. The studio is equipped with an 80-square-meter led wall and offers access to new technologies, e.g. augmented reality, virtual window or 3D models which offer new experience to our viewers as they watch thrilling matches played by the world’s top football stars”, adds Maciej Stec. Major financial figures for Q4 and for the entire 2018. “We ended last year with very good financial results in both segments of our operations. The Group’s revenue reached nearly PLN 10.7 billion, EBITDA increased to PLN 3.7 billion, with the net profit of over PLN 800 million. In Q4 alone our revenue increased by more than 17% YoY, to PLN 3 billion, with EBITDA growing by more than 10%, to ca. PLN 950 million. We have continued generating very high level of free cash flow, which has enabled us to pursue further acquisitions while at the same time reducing our debt”, says Katarzyna Ostap-Tomann, Management Board Member responsible for finances in Cyfrowy Polsat S.A., Polkomtel Sp. z o.o., Telewizja Polsat Sp. z o.o. “Very consistent implementation of our strategy has enabled us to propose an attractive and predictable dividend policy to our shareholders. Its realization, according to our estimates, will enable further debt reduction and generation of superior financial results so as to ensure strong and stable foundations for the Group’s further development,” adds Ms. Katarzyna Ostap-Tomann. CEO Tobias Solorz: “Our plans for 2019 include above all further growth and strengthening of our position on the media-and-telecommunication market, realization of the synergies generated from cooperation with Netia, continuation of pursuit of our multiplay strategy and smartDOM loyalty program, as well as investments to make our TV channels even more attractive. Unchangeably, care for the high quality of customer service, extensive distribution of the content produced by us and ensuring top level entertainment, information and sports events to our viewers remain our goals. I am convinced that our Group will continue along the path of stable growth while the assumptions for the present year and for further years will be achieved by us”. - Fiber-optic Internet access service with data transfer rates of up to 900 Mbps in Plus network, available also as part of smartDOM loyalty program. Constant modernization of the LTE network and implementation of further solutions in LTE Advanced technology which enable Internet data speeds to be increased to 600 Mbps. - EVOBOX line of set-top boxes − EVOBOX LITE and EVOBOX HD, combining satellite TV reception with the possibility of using VoD services over the Internet. New release of IPLA service, with new graphical design, new functionalities and program content, including HBO channels and UEFA Champions League matches. Further movie productions, realized in cooperation with Polsat Group, hit cinemas: ”Narzeczony na niby” (Pretended Fiancé), ”Serce nie sługa” (Love Cannot Be Compelled), ”Dywizjon 303. Historia prawdziwa” (Squadron 303. The True Story), and on the occasion of the 100th anniversary of regaining of independence by Poland, a movie entitled ”Niepodległość” (The Independence), based on archival, restored and colored film recordings, was produced in cooperation with Telewizja Polsat. 10th Anniversary of Cyfrowy Polsat’s listing on Warsaw Stock Exchange.